As my trip to the US gets closer (16 days, but who’s counting?) my mind is full of all the lovely little things I want to take with me to keep me looking lovely. After all, I don’t want to be greeted by my Las Vegas stretch limo hotel transfer looking like a bedraggled traveller! So I’ve been trawling blogs and beauty sites looking for some tips and tricks to keep me looking and feeling fresh while in transit. It seems the general consensus is moisture, moisture, moisture! Whether it be from the air con in the plane, the change in climate, the amount of partying and late nights or driving through the Las Vegas desert with the top down on your convertible (yes, I will be doing this!) there are lots of factors at play that will dry you out, so the trick is to keep your skin super hydrated and almost everything else should just follow. This hydrating mist toner from trilogy combines rose, geranium and lavender with a light alcohol-free formula to spritz and lift your skin at any time. This will be perfect for on the plane, I can just spritz every now and again from the comfort of my seat. The scent is pleasant but not overpowering so won’t annoy other travellers and you just let the formula dry naturally on your skin. It feels really refreshing and at the end of the day, spritzing this over my makeup makes it look freshly applied. It doesn't smell girlie so even guys can use this too. It cools your skin and just makes you feel nice and awake and fresh. 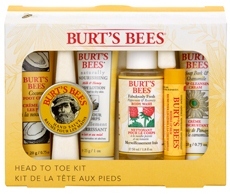 Can you believe I’d never actually tried anything Burt’s Bees before?? It’s a travesty! This stuff is sooo good for you skin and smells heavenly as well! The kit contains Soap Bark and Chamomile Deep Cleansing Cream (20g), Hand Salve (25g), Naturally Nourishing Milk & Honey Lotion (25g), Fabulously Fresh Peppermint & Rosemary Body Wash (50mL), Coconut Foot Cream (20g) and Beeswax Lip Balm (4.25). The perfect little sizes for travelling, these are easy to apply on the go and really will keep you soft and supple from top to toe. 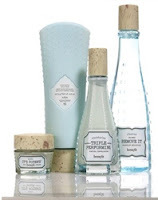 I have long been a follower of the gospel that is Benefit, especially their skincare! This kit contains Foamingly Clean facial wash 8.9g, Refined Finish facial polish 8.9g, Moisture Prep toning lotion 8.9ml, Triple Performing facial emulsion SPF 15 PA++ 8.9ml, Total Moisture facial cream 3g and It's Potent! eye cream 3g so again, the perfect sizes for travelling. The whole kit comes in a handy resealable clear plastic waterproof case and will keep your skin in amazing condition, including the eye cream which will help to disguise all those late Vegas nights! The Foamingly Clean facial wash is also the best face wash I've ever used and is not also pretty much the only one I will use. The It's Potent! eye cream also works wonders on dark circles and under eye bags. I LOVE this product! It’s the perfect combination of a lip balm and proper red lipstick. 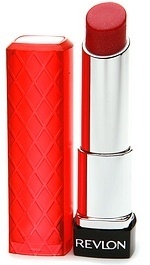 I use the Cherry Tart shade for a nice vibrant red, and it goes on quickly, smoothly and easily. It’s not as long lasting as a complete lip colour, but lasts longer than your average tinted balm. It keeps your lips soft while adding noticeable colour and doesn’t feel heavy or sticky. This is the perfect way to keep a polished looking pout on the go, so you don’t have to feel like you’re roughing it (or naked) on the road. I want my personal grooming and maintenance to be as minimal as possible while I’m away. I don’t want to be wasting time spending ages getting ready, I want to be out there and enjoying every minute of the experience, so I want to be as prepared as possible. Right before I leave I’m getting a proper brow sculpt and tint, my nails done, a fringe trim from a pro and eyelash extensions. If I can roll out of bed with a few enhancements and only have to worry about a quick pat of BB cream or powder, a quick slick of lip butter and a little swipe of liquid liner, I’ll be ready to face the world in no time. What are your recommendations for staying glam while you travel?